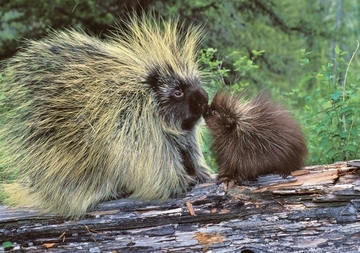 Quills form quite the hairdo on this porcupine mom attending her prickly youngster. These large rodents are found in many species throughout the Americas, Africa, and southern Asia. The North American porcupine (Erethizon dorsatum) inhabits the forests of Alaska, Canada, and the northern and western regions of the contiguous United States. Its sharp quills lie flat against the body until the animal is threatened—then they jump up into an intimidating shield. Contrary to popular belief, porcupines can’t shoot their quills at enemies, but the quills do break off easily and are barbed, creating certain misery for any unlucky attacker.